Early imports from Colombia to Australia were designated Hylocereus ocampensis (supposedly red fruit) and Cereus triangularis (supposedly yellow fruit). It is not quite certain to which species these taxa refer, though the latter is probably the red pitahaya. The fruit can weigh from 150 to 600 grams; some may reach one kilogram. MANILA - In a small rustic town just an hour and a half drive from Manila, there's a two-hectare farm off the main highway of Barangay Palaypalay, Jalajala town in Rizal. Farm owner Edna Sanchez, 62, said she is getting ready to harvest her crops in a week's time. 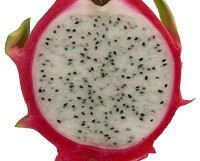 Unlike some farms in the town, Sanchez’s main crop is not rice or vegetables but dragon fruit. 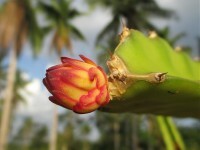 “I first saw the dragon fruits during a Lakbay Aral tour in Cavite in August 2011. I immediately took a liking to it because I thought the dragon fruit was unique. There wasn’t a lot of dragon fruit being sold in Rizal. And the fruit itself had a lot of health benefits,” she said. Sanchez bought a total of 4,000 dragon fruit cuttings in Cavite – at a cost of 100 pesos a piece or 400,000 pesos total - and made space in her farm for the new crop. 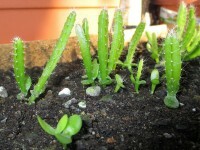 Pretty soon, majority of the farm would be taken over by the strange-looking cactus plants. ... "By April, we already had fruits – just seven months after we started. After six months, we had harvested about 4,400 kilos of dragon fruit, all naturally grown,” she said with a smile. Growing in tropical areas in Asia and Latin America, the dragon fruit (Genus: Hylocereus) is also known as pitaya or pitahaya in many countries. 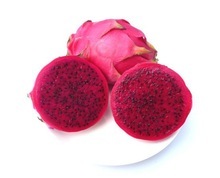 Other names include red pitaya, "dragon pearl fruit", "green dragon", "dragon crystal", and strawberry pear. This fruit grows from a cactus plant that either grows from the ground or climbs onto trees, which could reach up to 20-feet long when full grown. The fragrant flower of the dragon plant only blooms at night, and wilts during the morning—hence, the name "Night blooming Cereus", "Belle of the Night", "Queen of the Night", and "Moonflower". Apart from these exceptional characteristics, the fruit itself offers even more promise. The dragon plant matures within a year and starts to bear fruit around the same time, with an average of 5–6 cycles of harvest each year. 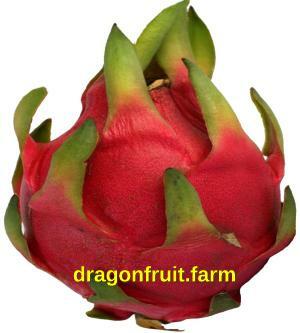 The football-shaped dragon fruit weighs an average of 150–600 grams with its outer skin either red or yellow in color depending on its variety. The flesh of the dragon fruit is white with tiny black edible seeds, with a texture much like that of a kiwi—soft, juicy, and a bit grainy, with a sweet-citrusy taste. BATAC CITY—In the last three years, the odd-looking dragon fruit has been attracting the attention of plant and fruit lovers and tourists alike. And with the high demand for this exotic fruit known for its therapeutic properties, idle public and private lands in Ilocos Norte, including village roadsides, backyards and school compounds, are being turned into pocket dragon fruit farms. 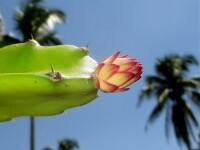 Agriculture experts said the dragon fruit plant grows well in the province because of its favorable weather condition. The plant requires easily drained and highly organic soil, less irrigation and minimal maintenance. LOS BAÑOS, Laguna, Philippines – There’s big money in dragon fruit production. In the first four years of a dragon fruit farm, one can realize an accrued net income of P2.5 million, according to the Mariano Marcos State University (MMSU) in Ilocos Norte. In the second year when the dragon fruit plants begin to bear fruits, a plantation owner can harvest at least 10 tons valued at P650,000. In the third year, 15 tons of dragon fruits valued at P1 million can be reaped.